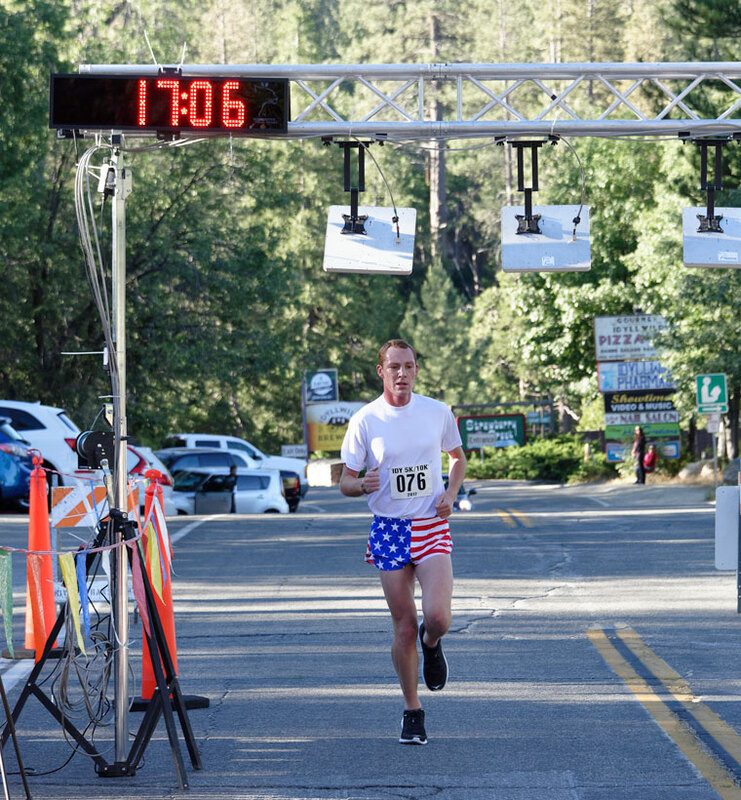 Runners are anxious to start the 10K race Saturday morning in downtown Idyllwild. 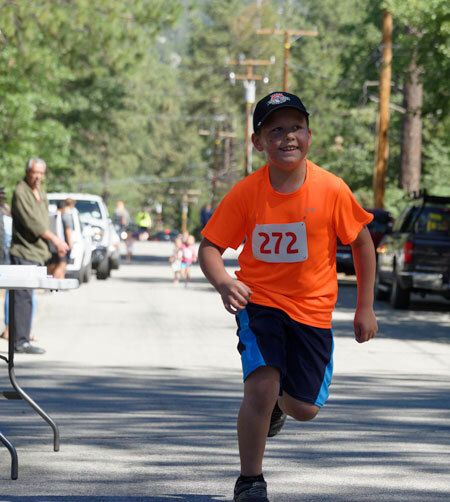 Race day, Saturday, June 10, Idyllwild at 7 a.m.: Runners and fitness walkers mill around seeking patches of sunlight. Temperatures are in the 40s, about to break 50 degrees. 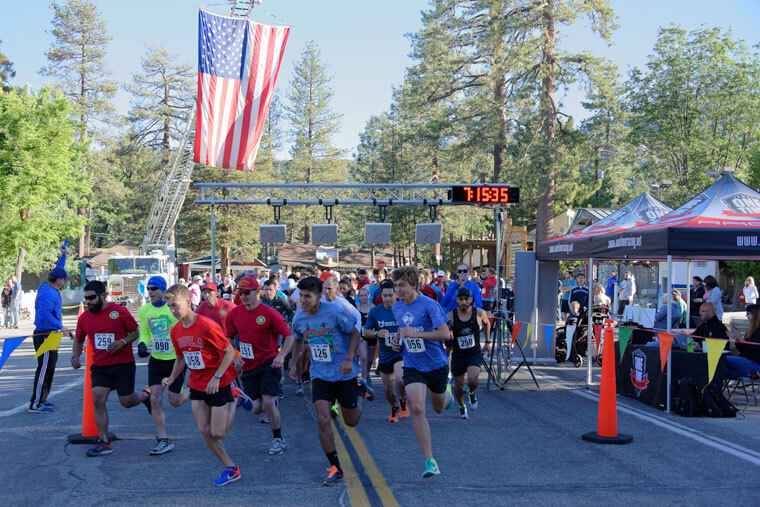 Brilliant light heralds a perfect day for the Idyllwild 5k/10k and Fitness Walk. Completing the picture is Dr. Chip Schelly on the microphone, doing his standup shtick of kidding the crowd. Local Jayden Emerson, 20, expected to win both the 5k and 10k, brought a friend from Beaumont who had never run the course before, Jacob Boatman, also 20. Emerson decided to run the 10k and Jacob the 5k. “Jayden had said he had shown his friend the course,” said Chip. And they did. At least half of the assembled 5k runners followed Boatman. The problem became that Boatman did not turn right to pass between the Fort and Jo’An’s, which was the correct course. He kept going straight past Suburban Propane toward the Shell station then turned left on Highway 243 with half the runners following behind him. At this point, the Mountain Community Patrol car gave chase attempting to catch and redirect the errant runners. It was like a Mack Sennett silent movie, complete with a comical music soundtrack. When the Boatman group turned right on Delano, MCP managed to halt them at the dead end, and directed them to turn around. “They [MCP] said their odometer read about 3 miles when they got back from their chase” said Chip, “so it should have evened out.” Five kilometers is 3.1 miles. 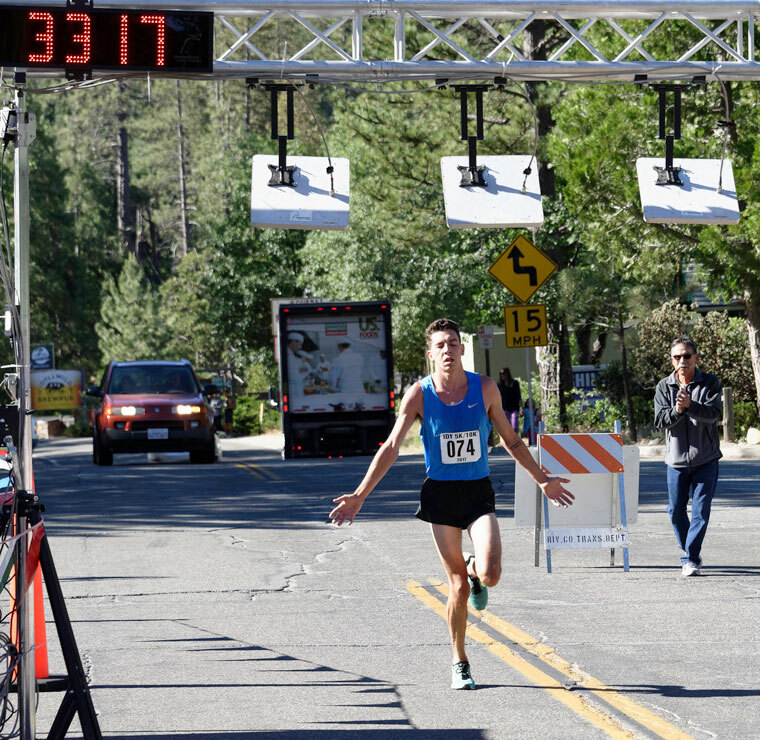 This is not a qualifying race and most of the runners took it in good stride, since the purpose of the race is to raise money for Idyllwild School physical education. Newlyweds Bill and Melissa Whitman finished first in their respective age groups. The Gnomettes, a five-woman team all of whom work at the Gastrognome — Kendra Wines, Brianna Ziegler, Tara Wilson, Amanda Tell and Laura Klingaman — finished together as rules required and donated their winnings to Idyllwild School. It was a good day — an only-in-Idyllwild day.